Edgar Allan Poe is one of the better known American authors from the 19th century. His tales of mystery and suspense have captivated audiences around the world. One of my favorites is one of his lesser known tales: "The Sphinx." In this story, Poe writes in first person of leaving New York City during a cholera outbreak and visiting a friend who lived in the country. While looking out the window one day, the author sees a horrific site: an enormous monster coming down a nearby hill. Poe screams in terror and falls unconscious to the floor. Days later, Poe's friend discovered the identity of the "monster." 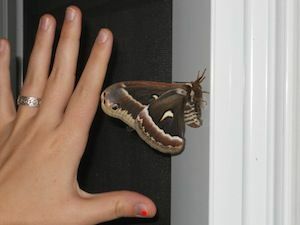 It was a moth, the so-called Death's Head Moth. It had only seemed large because it was on the window, just a few inches from Poe's face. I can relate to the narrator in this story. I've had problems in my life that seemed monstrous at the time, yet now seem almost laughable. The things that seemed so important five years ago are hardly remembered today. And I know that today's monsters will someday be revealed as nothing more than moths on a window pane. It's all about perspective. It's hard to have proper perspective when you're in the midst of a problem. That's why the Bible encourages us to take our worries and give them to God. The apostle Peter wrote, "Cast all your anxiety on him because he cares for you" (1 Peter 5:7). The apostle Paul said, "Do not be anxious about anything, but in everything, by prayer and petition, with thanksgiving, present your requests to God. And the peace of God, which transcends all understanding, will guard your hearts and your minds in Christ Jesus" (Philippians 4:6-7). God can take our worries and replace them with peace because he can see things from the right point of view, the eternal perspective. I'd love to tell you more. Join the conversation on www.hopeforlife.org or write to me at tarcher@heraldoftruth.org. "Perspective" by Tim Archer is licensed under a Creative Commons License. Heartlight encourages you to share this material with others in church bulletins, personal emails, and other non-commercial uses. Please see our Usage Guidelines for more information.